Let's begin with the bad news, if only because it isn't much of a surprise. Steve Eminger separated his right shoulder on Saturday night in Phoenix, and John Tortorella said after that game that the defenseman was "going to be out a while." And so today, we have a timetable for that injury: The team says he'll miss eight to ten weeks. Eminger isn't necessarily the most critical member of this team's defensive corps, but remember, the Rangers are already dealing with injuries on their blue line: Marc Staal hasn't played a game this season because of a concussion, while Michael Sauer is out indefinitely, also with a concussion. (Meanwhile, in less serious news, Jeff Woywitka was unable to practice today because of an ankle injury, and may not be able to play tomorrow night.) In a perfect world, the Rangers' six defensemen this season would have been, in no particular order, Staal, Sauer, Eminger, Dan Girardi, Ryan McDonagh, and Michael Del Zotto. Half of them are now out with injuries. Staal, who has been skating regularly with the team for the last week, said he continues to make progress. “I haven’t had a bad day mixed in, in a long time,” he said. “I’m still trying to get back in shape and get my conditioning back to where it was, but it’s at the point where it’s fun for me to come to the rink and it’s been a long time since I felt that way. Obviously, it's great news that Staal says that he hasn't had a bad day, health-wise, in some time. It's probably wise to keep expectations in check even when reading a positive update like this one, since head injuries are so unpredictable by nature. But any step that Staal takes going forward — be it getting cleared for contact, or anything beyond that — will be dictated by how he feels, so it's good to hear that he's progressed to the point where he says he's having fun at the rink. The Rangers would be crazy to push Staal to take the next step until he's absolutely ready — and even then, having seen what's going on with Sidney Crosby in Pittsburgh, it'll be a long while until we're no longer nervous about his condition. But no two concussions are the same, so we also have to fight the urge to compare his injury to anyone else's. Which means, basically, that we have little choice but to continue to wait and see what happens. The Rangers haven't had a losing streak of more than two games since beginning the season 0-1-2, and as a result they've maintained a strong position in the Eastern Conference standings. And they shouldn't expect any sympathy from their Atlantic Division foes these days — not with important players like Crosby, Chris Pronger, and Claude Giroux out with concussions. (Whether you like all those guys or not, by the way, their injuries are just terrible for the NHL in general.) 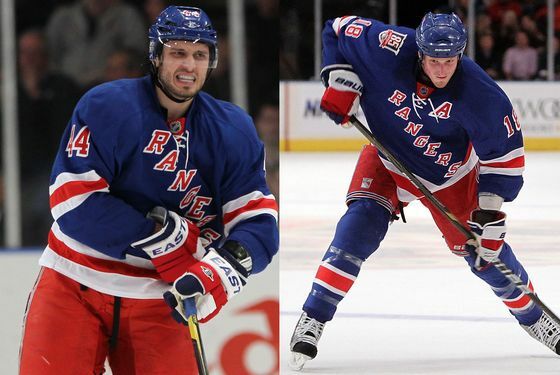 The Rangers have recalled Tim Erixon and Stu Bickel from Connectucut, but as the injuries on the blue line continue to pile up, it adds even more pressure on the defensemen who remain in good health. Though having said that, it's hard to imagine Dan Girardi playing any more minutes than he already is. Asking anything more of that guy would only be inviting more trouble down the line.